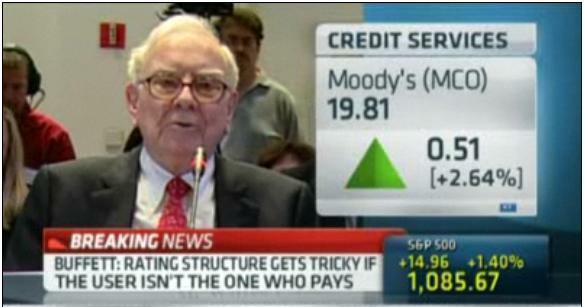 Was Buffett Too Easy on Moody’s in FCIC Testimony? Warren Buffett testified yesterday before the Financial Crisis Inquiry Commission along with Moody’s Chairman and CEO Raymond McDaniel. The purpose of the hearing was to probe the failure of the rating agencies to accurately rate securities associated with subprime housing loans during the real estate bubble. During the hearing, Mr. Buffett provided a lukewarm defense of Moody’s while acknowledging that ratings agencies failed to detect the bubble. In Moody’s defense, Mr. Buffett pointed out that nearly all Americans were caught up in the housing bubble and very few market participants thought that a nationwide crash in housing prices was possible. In addition, Mr. Buffett stated that he personally did not realize the extent of the bubble while it was forming. Mr. Buffett has stated on numerous occasions that a CEO of a major financial institution that requires taxpayer funded bailouts should suffer substantial financial penalties as well as lose his or her job. In addition, he has recommended that board members of such institutions also suffer financial penalties. Directors and Officers insurance would not cover the penalties under a taxpayer bailout scenario. This approach makes all the sense in the world given the distorted incentive structure at many financial institutions which calls for large payouts to a CEO who destroys shareholder value and must be removed from office. As Mr. Buffett has said, it makes no sense for a disgraced CEO to walk away from a failure with tens of millions of dollars in payments. But What About Rating Firms? Given the fact that the “raw materials” for the housing bubble were highly rated securities made up of subprime mortgages that were given AAA ratings, firms such as Moody’s have a great deal of culpability to answer for. While some may argue that the financial institutions that came up with these structures were acting deceptively, they would not have been able to sell these securities without inflated ratings. If one accepts the argument that inflated AAA ratings were to blame for much of the subprime crisis, then does it not follow that the CEO of a rating firm such as Moody’s should be held fully accountable for the mistakes? Mr. Buffett’s point regarding the fact that most Americans did not see the bubble coming does not mitigate the failure of analysts who were specifically hired to examine mortgage backed securities in detail and provide a stamp of approval in the form of a credit rating. From the description of the subprime crisis in books such as Too Big To Fail, The Big Short, and The End of Wall Street, it is painfully clear that the rating firms inability to accurately analyze subprime mortgages acted as a powerful enabler. While it is doubtful that Mr. McDaniel is personally responsible for these oversights, he took over as CEO of Moody’s starting in 2005 and the accountability for the failure must rest with him. Substantial shareholder value has been lost due to an impairment in the long term economic moat. The extent of that impairment is unknown pending the reform efforts underway in Congress, but the existence of some impairment in undeniable. Under such circumstances, it is not clear why Mr. McDaniel should not be evaluated in the same manner as the CEOs of large financial institutions that were bailed out.